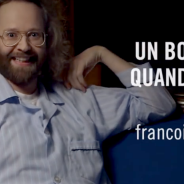 Last month I got a call from PMT to grade a TVC for François Bellefeuille, a Quebec humorist. The 30 sec edit shows a popular comedian subbing for Bellefeuille who didn’t want to perform his show that night. The first was treated lightly to keep the feel of the onstage look with bright blue lights. The last shot that shows Bellefeuille has more contrats and saturation to it. It looks darker on this YouTube video but the skintone was pretty rich.